"Again it`s a very happy day for me..Ya!! 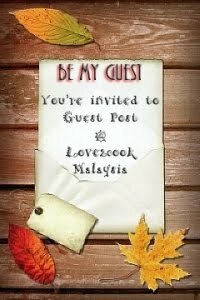 Another guest post of mine in a super food blog which is very familiar to you all..It is Love2cook Malaysia. The author of the blog Venisri who is a very straight forward, friendly, simple with perfect thoughts and also very lovely lady with no proud and jealous. What ever she feels express truly in good manner. I really like this quality of her. We became close through FB recently and from a long time I am a regular visitor of her food blog too. I like her beautiful kids and even I showed pics to my hubby too. HEHEHE...I love her presentation and most Important zooming on the pictures..I feel that the right zoom of the food pic reaches directly to heart of a visitor. It may* be the one of the serious reason why I jump into her space every time. Can you believe If I say that more than reading the recipes, by moving cursor from top to bottom I see the images in her space. Excuse Venisri..I revealed the truth...HAHAHAHA. Little bit personal : MAHADEV my elder son is 4 yrs old n my little one MAHADHIP is 2 yrs old. So,you can imagine my position and situation in home. .still, I'm trying to find some time for blog and recently started concentrating on pictures too. Last but not least,My husband is my great support and encouragement. Still If you are interested and want to know some more check in my Blog..."
Heat pan with 2 tsps oil and start frying 4 spices(SET-1) one by one which mentioned under onion. Add in chopped spinach and cook all this til mushy and let it cool. After few minutes grind it into puree and keep aside..
Now heat on the same pan if need add one more tsp of oil and fry black cumin,fennel seeds and bay leaf..Saute well. Throw the palak puree which ground above and mix well.Cook for 2-4 minutes in medium flame and throw kasoori methi and mix again. Cook for 5 minutes in low flame and add cream n mix.Cook for 2 more mins in low flame and turn off..
With this your PALAK GRAVY Is ready.you can serve with *rotis/naans* or just with plain rice/ simple pulav`s..
Other wise pressure cook or boil 3-4 eggs and remove skin,chop into half and throw them in palak gravy..This may called as SPINACH EGG GRAVY. Thank you Usha for giving a "life" for my silent blog here. It's really sweet of you for voluntarily offering to be my guest. I really appreciate that and thank you from the bottom of my heart. MahasLovelyHome had always been one of my favourites. I know how hard it is blogging with kids around. And I know how mischievous your boys are. But then what's more important than being with them, and doing things for them right? You are doing a really good job as a Mother and a Blogger. Thank you for your loveliest compliment on me, kids and my photos. You know I like to keep my photos simple, mainly due to laziness to work around with props..lol! Dear readers, hope you've enjoyed the guest post for today...and don't forget to hop over MahasLovelyHome for more tummy tickling recipes!!! Usha that is a lovely guest post. Palak with eggs sounds interesting.Loved ur intro too. True, Veni has a special way of brightening others day. Usha rani, the teenage mom you have done an incredible dish with palak and egg, sounds very unique and am loving it..Glad to know more about one of my fav blogger who is seriously very down to earth.. Kudos to you both. Delicious palak spinach egg curry also great guest post Sri and Usha.you guys did awesome post. This is a delicious dish. Looks great and I love the falvours. This gravy really looks gorgeous and inviting. Healthy also. Love the guest post.